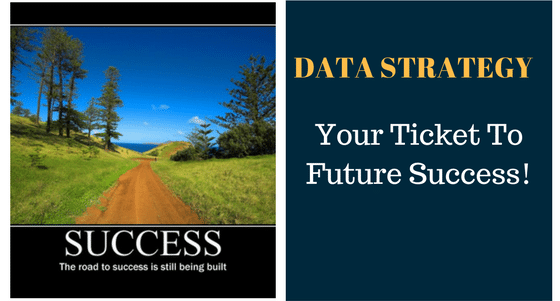 Part 1 of this series dealt with “Data Strategy – Your Ticket To Future Success – Part 1.” We’ll now talk about “How” to deliver Data Strategy in some simple steps. Strategy is about doing the right things and tactics is about doing things right. 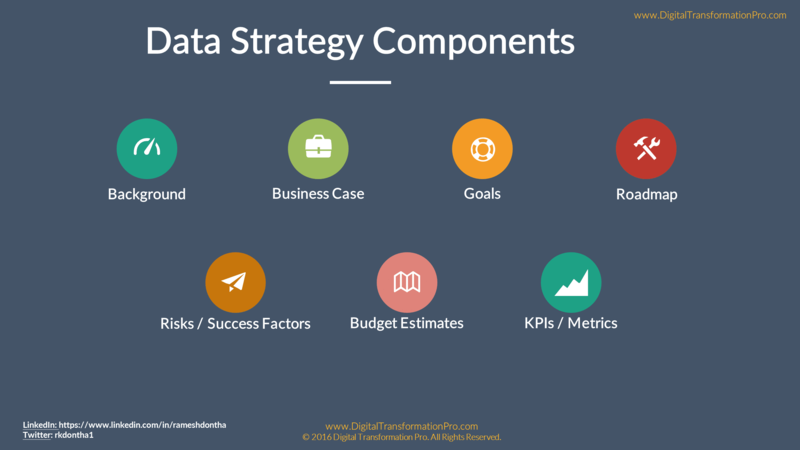 Data Strategy is about doing the right things to distill Data into insights for the organization. As I mentioned in Part 1, a good enterprise Data Strategy should be actionable to your specific organization and evolutionary to adjust to disruptive forces. Now let’s discuss the process to guide your organization to lay out your org-specific Data Strategy. 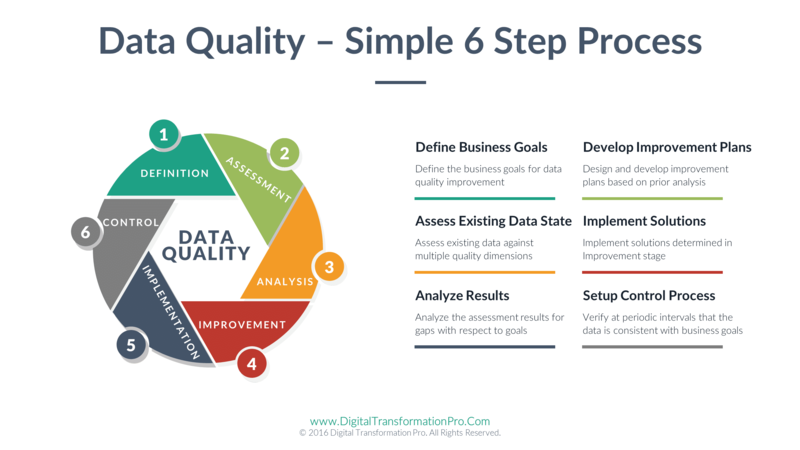 It is a simple 4 step process I’ve used and this high-level framework for Data Strategy addresses the key elements of People, Processes, Technology, and Data. 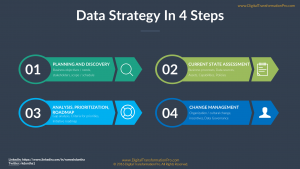 Here are the 4 steps to deliver Data Strategy. 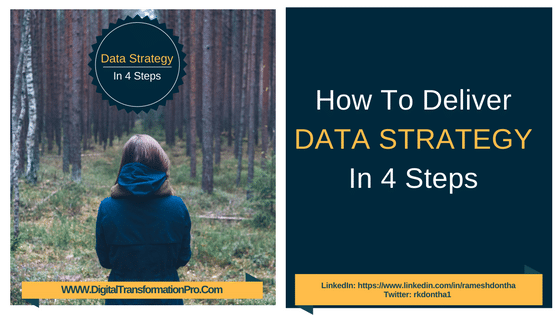 This step encompasses identifying business objectives & needs, enlisting sponsors & stakeholders, defining scope & schedule, and discovering technology & data assets that have a role in the Data Strategy. I’ll dig little more into business objectives and stakeholders points which I believe are very crucial. In my opinion, there are 3 types of stakeholders you need to take into account. Executive sponsor(s) : I can’t under estimate the importance of finding and aligning with executive sponsor (s) that’ll support you through the ups and downs of formulating the Data Strategy and implementing it. Right talent on your team: Make sure to influence and evangelize to the people with right skills / talent to be on your team. Explore both internal talent as well as external consultants. Potential trouble makers: Every project / initiative will have some ‘stakeholders’ who either deliberately or unintentionally are opposed to change. Knowing who they are and their motivations upfront will help you later in the process. In this step, focus primarily on current business processes, data sources, data assets, technology assets, capabilities, and policies. The purpose of this exercise is to help with gap analysis of existing state and the desired future state. As an example, if the scope of the data strategy is to get a 360 view of customers and potential customers, the current state assessment would include any business process, data assets including architecture, capabilities (business & IT), and departmental policies that touch customers. Current state assessment is typically conducted with a series of interviews with employees involved in customer acquisition, retention, and processing. One important observation I made during assessment is that you’ll come across people in the organization that are natural data evangelists. These people truly believe in the power of data in making decisions and may already be using the data and analytics in a powerful way. Make note of these people and make sure to take their help in later phases to drive a ‘data-driven’ culture in the organization. This phase is probably the most intense and contentious phase and without a doubt will account for majority of the time in formulating data strategy. With Big Data and Cloud computing, the analysis has gotten even more complicated than in the past. With the desired future state in mind, analysis should focus on identifying gaps in data architecture, technology & tools, processes and of course people (skills, training etc.). Big Data brings new data sources into the mix and Cloud computing enables new options for data integration and data storage. The gap analysis will present multiple strategic options for initiatives and the next task is to prioritize these options with business objectives / needs as the primary criteria. The sponsors and stakeholders will have a key role to play in prioritizing these initiatives. The end result of this phase is a roadmap to roll out the prioritized data initiatives. 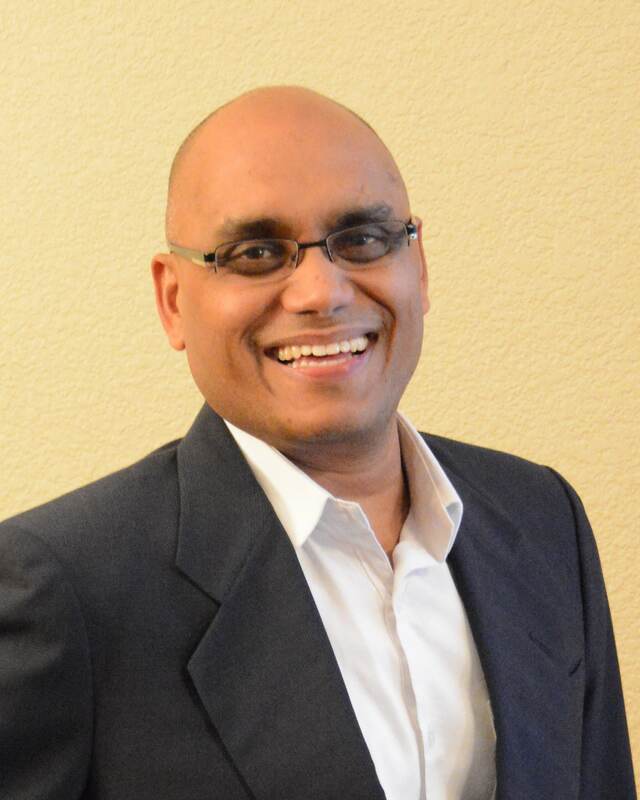 Without going into too many details, some of these data initiatives could be Data Governance, Data Quality, and Master Data Management (MDM). Would like to hear from you about this process. Please feel free to comment.